Atlanta Dream guard Shalee Lehning is retiring, due to complications from knee surgery. The Storm re-signed Allie Quigley, waived guard Alison Lacey and renounced the rights to guard Jessica Bibby and forward Katie Gearlds. #23 DePaul kicked the butts of #12 Louisville, 86-61. #25 Kansas just got back in the top 25 today, to lose to Oklahoma in overtime, 74-68. UConn defeated Duke, 61-45. It was the Blue Devils' lowest point total and lowest number of assists in a game this season. 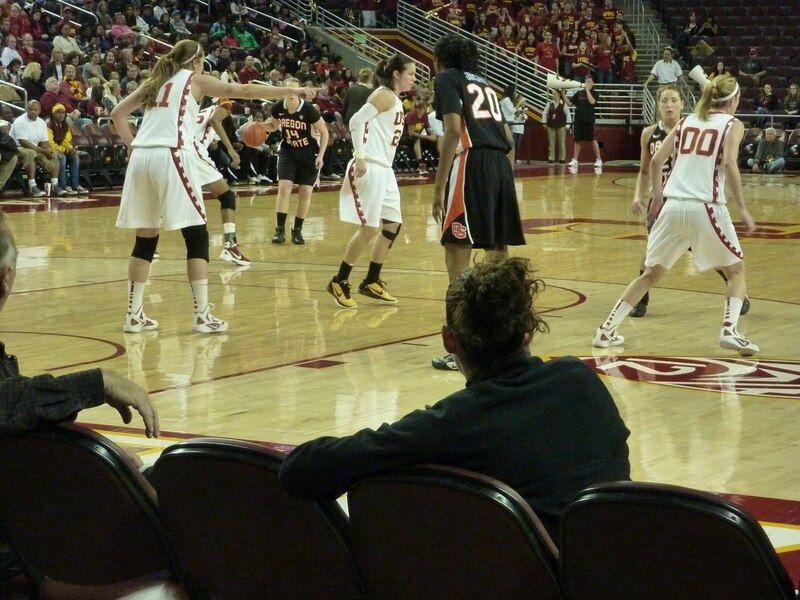 The USC senior guard injured her knee last Thursday in the Colorado game, and sat out Saturday's contest. Today she had the knee checked out and her ACL is NOT torn. She is day-to-day and isn't sure when she'll return to action. Core, reserved, restricted free agents, unrestricted free agents and trades are listed here. And it's an interesting list, to say the least. Nate shares ideas on what each team should do with their players. Check out my story, "Big West leader Cal State Northridge survives Cal State Bakersfield," which recounts Saturday evening's exciting matchup. The gym lighting didn't work too well for my camera, but here is a small gallery of game shots anyway. I have the highest respect for both coaches Jason Flowers and Greg McCall, and am excited to see what they'll be doing with their teams over the next several years. Oregon State won the battle of the Civil War with Oregon, taking the win yesterday, 67-60. UCLA was a double winner, beating Utah Thursday and using an overtime today to overcome Colorado. USC lost to both mountain schools, which means they have three consecutive losses. Trojan forward Briana Gilbreath was injured in Thursdays game and didn't play yesterday, missing the first game of her career. Her knee will be evaluated tomorrow. I'm taking votes: who is this year's most improved player? #18 Georgetown held #12 Rutgers to 36 points. Minnesota took down #9 Ohio State. Michigan State defeated #19 Penn State. #13 Texas A&M 66, Iowa State 64. #25 North Carolina 75, Wake Forest 71. Cal at Stanford photo gallery. Baylor stomped Kansas, and Brittney Griner is now second on the NCAA blocks list. Charlotte senior forward Paige McCallum has been dismissed from the team. She had been suspended both this season and last. #3 Connecticut visits #5 Duke. Kara Lawson and Cindy Brunson preview. 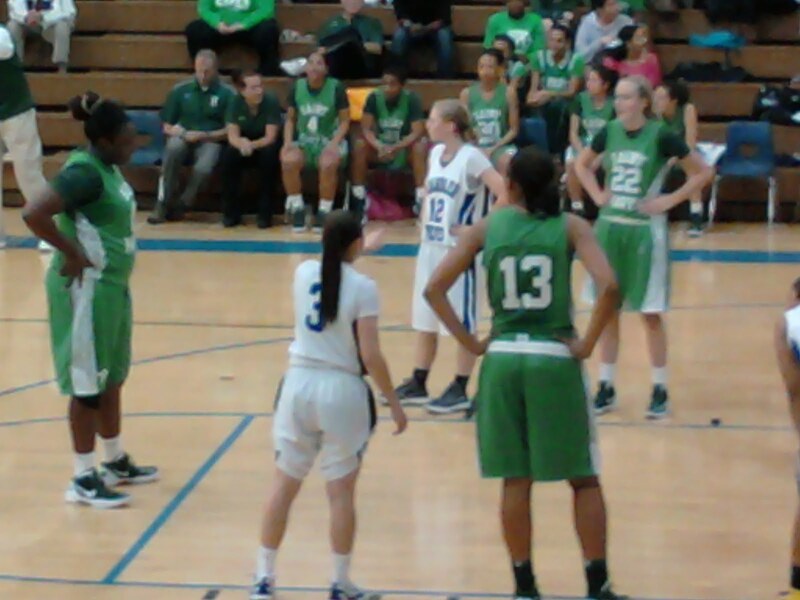 Mechelle Voepel discusses three-pointer possibilities. Friday night's game involved two teams that play in the Orange Empire Conference (OEC). The OEC has seven teams - six from Orange County and one from Riverside. Coming in, Santa Ana had an overall record of 5-15, and a 0-6 in conference. 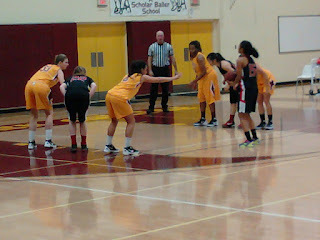 Saddleback was 15-4 overall, and 4-2 in conference. One girl who didn't score a lot of points last night, but impressed me with her hustle, rebounding and passes to help her teammates was Shala Kirkpatrick, a freshman from El Camino HS in Oceanside. In conference play Kirkpatrick averages 9.3 ppg and 10 rpg. The Cal State Northridge-Cal State Bakersfield game I attended also went down to the wire. My game story will be posted soon. Tomorrow's big match ups feature #12 Rutgers at #18 Georgetown and #9 Tennessee at # 15 Georgia. Elena Delle Donne and Delaware take on James Madison. Lady Vols rank their concerns, in top-10 fashion. One of today's 116 games is the "battle of the Bay," featuring surging Cal at #4 Stanford. The Bears were the last conference team to defeat the Cardinal, five years ago. Can they do it again? In other Pac-12 action, Oregon's civil war will play out its first installment at Oregon State, who hosts the Ducks. Liz Brenner was playing volleyball for Oregon, and last month became a walk-on to the basketball team. She's a key factor for them now. OSU coaches, meanwhile, have restored the good will of the program since being left with ashes two years ago. Today should be a heck of a battle. Personally, I'll be checking out some Big West action today, as Cal State Bakersfield (coached by DeWanna Bonner and Erica McCall's dad) visits Cal State Northridge (headed by coach-on-the-rise Jason Flowers). The episode occurred late in the Falcons' 70-54 win over Eastern Michigan at the Stroh Center Sunday. Miller spoke with EMS workers at the game following the win, his 250th career victory at BG, and went home immediately following the contest. He rested at home Monday but was back with the team Tuesday, taking part in practice and then traveling with the Falcons to Ball State. Cal's Brittany Boyd has skills that can't be taught. Duke freshman Elizabeth Williams has grabbed the spotlight early. USA Basketball has named Breanna Stewart its 2011 Female Athlete of the Year. The Cicero-North Syracuse High School star was a member of both the U19 World Championship Team and USA Pan American Games Team. Three suspended Central Michigan University freshman ballers have apologized for their unspecified actions. North Carolina Coach Sylvia Hatchell banned twitter use for the Tar Heels. That distraction eliminated, the team has won two in a row. I understand where Hatchell is coming from. I cringe at some of the things I see young people put on twitter. Do you think athletes should be banned from twitter use? Vote. Dishin & Swishin talked to Lisa Leslie this week. Tonight's upset (so far): Virginia Tech over #7 Maryland, 75-69. There are other games in progress, and the final games of the night begin in 20 minutes, so there may be more later. Kelsey Bone is embracing the challenges at Texas A&M. In case you all haven't noticed, San Diego State is kicking booty this year. UTEP guards Ryah Lacy and Chrishauna Parker are suspended from the team indefinitely for a violation of team rules. Tonight's upset (because there's one every night this season): Kansas over #23 Texas Tech. Carolyn Davis lead the Jayhawks with 34 points. Brace yourself: this Saturday there are 116 college games on tap. The WNBA will celebrate National Girls and Women in Sports Day Feb. 1, with events across the USA. Class of 2013 check: Mercedes Russell continues to deliver. The Springfield, Ore. junior last night posted 32 points, 15 rebounds and eight blocks in a game against a big rival, because her coach asked her to do so. At least two Division I coaches had traveled to witness the game in person. Russell has been taking unofficial visits to colleges since last year. Other hot sophomores, juniors and seniors, as noted by ESPN. Former Virginia Coach Debbie Ryan will be inducted into the Virginia Sports Hall of Fame. Hard to believe it's the third anniversary of Coach Kay Yow's death. A flashback from Dishin & Swishin. The Big South Conference is adding Longwood University. Former Kentucky star Merlene Davis discusses her family's slave heritage in a new book. In the wake of their thrashing of Tennessee last night, ESPN says the sky is the limit for the Notre Dame Irish. Oklahoma State over #13 Texas A&M. And also, LSU barely escaped East Tennessee State, in overtime. The No. 2 vs. No. 3 matchup on Saturday did not live up to its billing. Nazareth still is reeling emotionally over the death of coach Apache Paschall, and the Lady Kingsmen were playing for the first time since he was put to rest. Los Angeles – The Los Angeles Sparks are pleased to announce that majority investor Williams Group Holdings LLC, (WGH), has increased its investment in the team and has taken a more active role in the day-to-day business. WGH became an investor in September 2007, and has seen the team grow both on the court and in business over the past two years, prompting their decision to increase their involvement. As part of this transition, Carla Christofferson and Katherine Goodman will resign from the Board of Directors, but will retain their financial investment in the Sparks. The enhanced role demonstrates WGH’s support of the Sparks and their business goals. This will allow the Sparks and WGH to utilize each of their assets to continue establishing a strong foundation with an emphasis on strategic growth. WGH Managing Partner Paula Madison will become the CEO of the Sparks. Not only did Notre Dame crush Tennessee, the Vols set a school record for fewest points scored in a game. Yet another ACL tear, and this time it's Miami's Morgan Stroman. Is it just me, or are there more ACL tears this year than usual? It's painful to witness. The Minnesota Lynx have re-signed Taj McWilliams-Franklin, aka "Mama Taj." Terms of the deal for the 41-year-old forward were not disclosed. Lynx Coach Cheryl Reeve will be honored by the Philadelphia Sports Writers Association. Assistant Coach Doug Bruno shares the same philosophies as head Coach Geno Auriemma. Full photo gallery - check it out! - Jacki Gemelos, who had surgery Jan. 17 to repair her torn left ACL, returned to Galen Center for Saturday's game to cheer on her teammates. She came in on crutches and sat beside the team bench. Gemelos went into the locker room with the Trojans both at halftime, and after the game. - A lively crowd of 1,803 was on hand for the contest. The excuse that Los Angeles residents don't attend women's basketball games because there are too many things to do in the city is untrue in Troy. A big crowd almost always shows up for weekend games, and they are loud, too. Several kids wait outside after the game for players to come out and sign autographs. - Lisa Leslie and several other former USC players were recognized at halftime. Leslie became like the Pied Piper as she walked around the arena, attracting groups of kids wherever she went. At one point she stopped to give Gemelos a hug. When she turned to leave, she found herself surrounded by children who had spied her, ran over and lined up to talk to her. Leslie took time out to sign autographs for them. - Oregon State is a very well-coached team. Coach Scott Rueck has done an admirable job of schooling players in the fundamentals; they don't miss many buckets, wherever they are. The team's outside shooting is exceptional. Not many are looking to Oregon State for anything in the Pac-12 over the next few years, but they will be surprised. The Beavers are going to sneak up on everyone. - It was unfortunate to see how upset USC players were after the game. Not only did they feel the win should have been a "give me," but they wanted to take the victory for Gemelos. Who will make the 2012 Olympic basketball team this year? Both myself and my favorite Division I assistant coach and columnist agree that there will be a change of the guard this time. He says there are five locked positions: Sue Bird, Diana Taurasi, Sylvia Fowles, Seimone Augustus and Candace Parker. He also sees Brittney Griner making the squad. Whom should be chosen? Speak. Elena Delle Donne made Sports Illustrated, and today she and her team took charge to put the hurt on Drexel. Kentucky struggled to overcome Florida. Iowa State beat #20 Texas Tech and snapped their five-game winning streak. South Carolina continued their hot streak, upending #22 Vanderbilt in overtime. I'll be posting something on the OSU at USC game tomorrow morning. Where to start when there's 109 games in a day? Notre Dame is unbeaten in the Big East. Baylor's home game winning streak is at 34. San Diego State, who is at 4-0 in the Mountain West Conference after grabbing their tenth consecutive win today. Florida Gulf Coast University, who is at 9-0 in the Atlantic Sun Conference. American University, now 5-0 in the Patriot League. Sacred Heart, 7-0 in the Northeast Conference. Florida A&M, at 6-0 in the MEAC. Wichita State, which is 7-0 in MVC play. Idaho State, at 6-0 in the Big Sky Conference. Middle Tennessee, 8-0 in the Sun Belt Conference. McNeese State is 5-0 in the Southland Conference. Marist is 8-0 in MAAC. Eastern Illinois is 5-0 in the OVC. High Point is 6-0 in the Big South. Let's give it up for the smaller schools. And Cal State Northridge Coach Jason Flowers was one of my top mid-major coaches to watch last month. The Matadors are getting better at finishing games, and are tops in the Big West Conference at the moment. But they couldn't quite close out in double overtime today, losing to UC Santa Barbara. It seems to be an intense day of play on both the women's and men's side of the basketball world. I went to the Oregon State at USC game today, which went to overtime. My story should be posted tomorrow morning on hoopfeed.com. Tamika Catchings and the SEC support Tennessee Coach Pat Summitt during the conference's "we back Pat" week. Jim Littell, who replaced Kurt Budke at Oklahoma State, has received a huge raise. Kean University has removed Michele Sharp as basketball coach. North Dakota Coach Gene Roebuck will retire after this season, which is his 25th. I've said before that San Diego State point guard Chelsea Hopkins is the real deal. Check her out in this interview. LSU starting point guard Destini Hughes is out for the season with torn knee ligaments and a torn meniscus. Tennessee beat LSU in an injury-prone game. Tulane snapped a two-game losing streak by putting away Alabama-Birmingham. In USC's victory over Oregon, Trojan forwards Briana Gilbreath and Christina Marinacci each had a double-double. Cal State Northridge edged Cal Poly, 79-77, in a game with a wild finish. Wisconsin-Green Bay overcame Youngstown State and are now 16-0 - the best start in program history. UConn's Tiffany Hays passed the 1,500-point mark in the Huskies' win over Cincinati. San Diego's Dominique Connors also surpassed 1,500 points. It's official: Marynell Meadors, Doug Bruno and Jennifer Gillom are the assistant coaches for this summer's Olympic Games. Beth Mowins and Debbie Antonelli talk with Geno Auriemma and Tamika Catchings. Jennifer Gillom will join an exclusive club of those who have been both a player and a coach at the Olympic Games. Hard to believe, but it's time to start preparing for this year's McDonald's All-American game. This year, it's in Chicago on March 28. Here is the list of nominees (girls begin on page eight). Michelle Smith checks in with Arizona State's Charli Turner Thorne, who is on sabbatical this year. Dishin & Swishin talks to South Carolina Coach Dawn Staley. Every possession counts for St. Bonaventure. Erica McCall - #16 in the class of 2013 - has posted triple-doubles in each of her last three games in Bakersfield, Calif. You go, girl. The season will begin May 18 and end Sept. 23, with a one-month break in the middle to facilitate the Olympics. Bonus: yesterday's chat with 2011 MVP Tamika Catchings. Alabama's Ericka Russell has been granted a medical disqualification for previous knee injuries, ending the senior's college career. Oklahoma has lost starting forward Joanna McFarland indefinitely. She had surgery Monday for a broken jaw. The Washington schools are in Northern California for Pac-12 play. Washington State's loss record against Stanford dates back to 1983 - 52 games ago. Texas A&M beat Missouri tonight, and gave Coach Gary Blair his 200th win. #15 Louisville is unbeaten at home. Missouri guard Bailey Gee uses music to fend off stress. Tomorrow is the Tennessee-LSU showdown (and I know two UCLA fans who will be there). The Vols, reeling from injuries, will have to dig deep for a win. Nikki Caldwell says she's committed to LSU and isn't looking to be Tennessee's next coach. She says associate head coach Holly Warlick has a resume that more closely matches Coach Pat Summitt's. Sources say three assistant coaches for this summer's Olympic games have been named, and are Marynell Meadors, Doug Bruno and Jennifer Gillom. Interesting combination. Each night the question grows louder in my mind: who will win this year's NCAA championship?? It's wide open. St. John's stays hot and upsets #8 Rutgers tonight, 62-57. Not-so-surprising: South Florida downed #19 DePaul. Oklahoma took down #22 Kansas State. What did Notre Dame eat for breakfast? They beat Pitt 120-44. Utah Valley beat Walla Walla by almost the same margin: 104-46. Ariel Massengale has broken Tennessee's freshman record for assists - and this after being out with an injury for two weeks. The Mystics have hired Jennifer Gillom as assistant coach. Tamika Catchings will chat tomorrow on SportsNation. The super-cranial Division I assistant coach who penned the "Mid-Major coaches to watch for" column in December is back. This time he's tackling the gigantic subject of NCAA disparity in the West, and what he says should be done about it. As always, your input is appreciated. Twenty years. That was the last time a school west of Lubbock, Texas has won a NCAA Division I Women’s Basketball championship. Twenty long years: That’s pre-iPod, pre-OJ Verdict and pre-Bill Clinton being President. And in over the double-decade drought since Stanford last cut the nets and a West coast team has worn the crown, women’s basketball has undergone some significant changes. However, the one constant is that there has been only one BCS program in the west in the national championship discussion every year. So while there are a myriad of reasons why the title drought has occurred, rather than delve into the reasons why there hasn’t been a champion west of Texas in the last twenty years, let’s examine why can be an argument made that of importance of why a BCS-level championship program NEEDS to emerge in Southern California is just as important. There have been challengers who make an occasional two- to three-year run, but as sure as the sun rises in the east and sets in west, Stanford seems to always be there at the end making another Sweet Sixteen or Elite Eight run. And armed with athletic administration committed to success, a Hall of Fame coach in Tara VanDerveer and tons of talent still flowing into Palo Alto, it also stands the reason that Stanford isn’t going anywhere. Nice, So what’s the issue? The problem isn’t that women on ‘The Farm’ are too good. The problem is that there hasn’t been a consistent BCS challenger on the west coast to act as a counterbalance - Specifically to draw more media and fan interest. Like Bird needed Magic, Batman needed the Joker and Coke needs Pepsi. Stanford needs a counterbalance out west, a true competitive rival. At first glance the Cal Bears could provide that rival. One could argue that the rivalry could be a situation similar to Duke-North Carolina in men’s basketball on Tobacco road. The hiring of former UCSB Head Coach Lindsay Gottlieb was a savvy hire by Cal’s AD Sandy Barbour. Gottlieb’s bright (former Ivy leaguer), understands the Pac-12 (was a former Cal Assistant) has already made waves on the recruiting trail (securing the services of top ten recruit Justine Hartman last year) and appears to be committed to being at California for the long haul. But while Cal appears to be set up for long-term success and has a chance to battle Stanford for Bay Area supremacy, it’s not Los Angeles. And the sheer number of eyes and ears of media and potential fans in Los Angeles is what would move the proverbial meter in terms of coverage and viewers. And while one can look for Cal to rise in the near future, there is an inherent need for women’s basketball to be firmly entrenched in the nation’s second largest media market outside of New York. Southern California and women’s basketball needs a perennial Elite Eight women’s basketball program. Though the most of the influential sportswriters in America reside in the eastern or central time zone, recently there been a subtle movement of more western attention. Online bloggers and social media have help turn attention westward. The company News Corp Digital Media Group (Fox Sports) is now a dominant fixture in sports broadcasting and are centered on the West Coast. Even ESPN has opened a studio in Los Angeles. With this rise of media power, slowly the Pac-12 and its members are positioning themselves as major players in television and online distribution of its members content. Examine for a moment some of the moves that Pac-12 Commissioner Larry Scott has made after taking over in 2009. These are moves that are primarily initiated by football and increasing leverage with television contracts, however each of these moves have a significant effect on women’s basketball in terms of additional financial stability to fire or keep coaches in place and for scheduling should not be. But also relevant to the discussion of basketball are that the moves also create a tremendous window of opportunity for women’s college basketball in the west in terms of viewership – Which could be generated by a Bay Area-Greater Los Angeles-area rivalry among two BCS teams playing at an elite level. An USC-Stanford or UCLA-Stanford rivalry immediately has the potential to register much like a Tennessee-UConn rivalry in the east. A rivalry with Stanford and either would provide two major things: Combatants with a tradition (which Stanford and both USC and UCLA have) and cache (BCS “Name” schools) in and two large media markets. There would also be an added plus: recruiting. For years, recruits on the west coast saw Tennessee and UConn on television. In fact, they almost ONLY saw Tennessee and UConn on national television. And subsequently, seeing these two on national airwaves helped the schools become real and tangible viable options as destinations to play. Mega-prospects like Diana Taurasi and Sade Wiley-Gatewood, who have National High School player of the year credentials headed east. In college athletics, recruiting, especially accumulating the 5-Star recruits, is the name of the game if a program is to be successful at a level to compete for national championships (For comparison UConn has three players in the Top 15 in the country in most recruiting rankings). And keeping California talent in California and is the first step to maintain elite level success for both UCLA and USC. The buzz of a hotly-contested rivalry with two state teams from different regions, that could win a national championship, just may help keep some of that Golden State talent at home to help get these programs over the hump and win the NCAA title. Imagine what may of happen if Diana Taurasi had decided to stay “home” and of been a Bruin and played in Pauley Pavilion or decided to wear the Cardinal & Gold of USC. How would the history books been rewritten? What other recruits would she of attracted to either program? Could there of been a USC dynasty like the Cheryl Miller-Cynthia Cooper-McGee Twin era, but only this time in the digital 24 hour media age? Intriguing to think about, isn’t it? Both the Women of Troy and Bruins have the financial resources, the access to recruits and the opportunity to make a dent in the Stanford dominance of the Pac-12. Both institutions haves hired coaches in the last few years who are committed to staying each school and building strong programs nationally. Each have made or in the process of making upgrades in facilities. Each has begun to creep higher in the national recruiting ratings. The only question is which program can make the final leap. Which of the two LA programs can catch “The Big Red Machine” up north? Only time will tell. But for the potential boon it could be in terms of exposure for women’s basketball in the nation’s second largest media market and on the West coast, the hope and the need, is sooner rather than later. Orange Lutheran High School hosted the third Annual Tony Matson Classic yesterday. There were five girls games played and one boys game scheduled as the nightcap. All proceeds go to help the Matson family after the untimely death of the Orange Lutheran coach in 2009. Tony was extremely well-liked by his peers, his players and the Orange Lutheran community. The game that appeared to be the most competitive turned out to be the closest game of the day: Brea Olinda vs Troy. Brea is coached this year by Kim Cram-Torres, who came from Villa Park High School. She replaced longtime coach Jeff Sink, who now coaches the Brea boys team. Troy is coached by Roger Anderson. The one thing that is noticably different from past Brea teams is their size. Without Justine Hartman, Jeanir Olekumi, Amanda Arter and Amber Van Deudekom, the Ladycats not nearly as big as they were over the past four seasons. Brea still has three exceptional players in Anna Kim, Keitra Wallace and Taylor Spears, and all three played strong games yesterday. Troy is led by Gabby Hanson, Shelby Dougherty, and Alicia Dimas. Hanson and Dougherty played well for Troy while Dimas was in foul trouble early in the game and only saw limited action. The game started out strong for Brea as they led 10-2 in the first quarter, Brea extended their lead to 24-12 in the second, and led 34-25 at halftime. At the end of three quarters Brea led 46-31, and it appeared not to be Troy's night. However, the fourth quarter saw Troy storm back to trail by two points at 53-51, with 27 seconds left on the clock. Troy had two or three chances to tie the game during that period, but couldn't get their shots to fall. 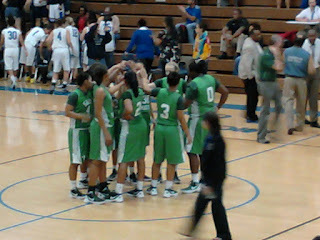 Brea won 53-51. The other games saw Rosary defeat Mayfair 50-39; Yorba Linda beat Santa Margarita 55-33; Mater Dei defeated Canyon of Anaheim 63-27, and both Jordan Adams and Nirra Fields played strong games. The final girls game saw host Orange Lutheran stomp the Santa Monica Vikings, 64-36. Orange Lutheran plays very good "team" game under current coach Tom Howard as they did under Tony Matson. They may not be the most talented team in the area, but every time I see them play, they always work the ball for the open player. Tony would be very proud of them. There were several college coaches or assistants at the event, including coaches from UCLA, USC, UC Davis, Santa Clara, USD, and a couple of Juco coaches from Orange Coast College and Santa Ana College. There were also several high school coaches and players from teams not playing, which I thought showed great support for a good cause. Make sure you click on January 16. 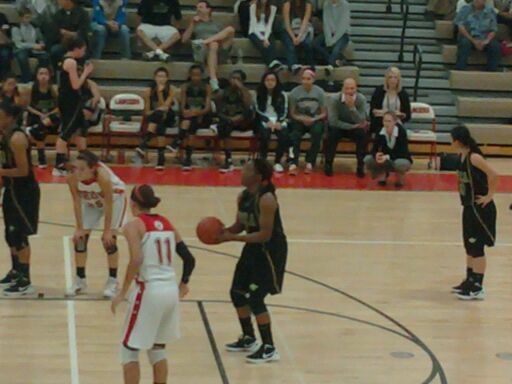 Future college players: Jordan Adams (USC) waits to shoot free throws while Mater Dei teammate Nirra Fields (UCLA) and Canyon's Christina Salvatore (University of Idaho) await the shot. Brea's Taylor Spears, at the foul line, Anna Kim behind the arc, and Keitra Wallace, on the left of the picture, all had strong games for the Ladycats. Troy's Gabby Hanson, #11 in white, also played well. UCLA assistant coach Tony Newnan, in the blue and gold jacket, chats with Nirra Fields after the game. Orange Lutheran's Abbey Goodsell, (#24) scored 18 points to lead all scorers in their rout of Santa Monica. All pictures by IM in OC. Women's Sports Centrals podcast features Brenda VanLengen and Mechelle Voepel discussing the Big 12, SEC, ACC, and Big East. Checking in with Yolanda Griffith, who is an assistant coach at Dartmouth. That knee injury Tennessee forward Shekinna Stricklen sustained in yesterday's Vanderbilt game? It's a sprain. And she's day-to-day. Kentucky tops the SEC at the moment. The Sacred Heart High girls basketball team in Los Angeles walks through the 'hood everyday to get to the gym for basketball practice; it's a facility they rent out with what money they have. Every day, they confront dangers along the way. Story. Upset: #25 Penn State over #23 Nebraska, 93-73. #11 Miami barely survived Florida State, 60-57. Florida beat LSU 62-58, snapping the Tigers' 10-game winning streak. Please, not again: Tennessee defeated Vanderbilt, and Vol forward Shekinna Stricklen scared the crap out of her team when she clutched her knee and started screaming. It looks like it's just a knee strain, though. Elena Delle Donne also sustained a leg injury in Delaware's victory over Northeastern. Kentucky remains undefeated in SEC play after today's win over South Carolina. Cal took Utah, making for a sweep of the Pac-12 mountain schools. ESPN's Graham Hays has a (so far) weekend wrap up, which he calls "all hail the Big Ten." Many smaller schools have games tomorrow, on the Martin Luther King holiday. Exodus Coach Apache Paschall was laid to rest yesterday. The NCAA Division I Board of Directors wants a new stipend proposal, since the one to give athletes $2,000 a year was tabled. The new basketball: anyone can win at any time. Kansas State handed #14 Texas Tech its second consecutive loss. Saint Mary's upset #22 Gonzaga in a close one. #19 DePaul hung on to beat Pittsburgh. Rutgers held off Louisville in overtime. Cal State Northridge rallied to take Pacific, 72-68, and end their eight-game home winning streak. San Diego State defeated UNLV in overtime, 66-62. UC Irvine squeaked past Cal Poly, 62-60. Arizona overcame Oregon State, 58-56. Arizona State snapped a three-game losing streak by eeking one out over Oregon, 53-49. What was in the air today with all these close games? Today's Southern California Pac-12 showdown was every bit the bloodbath battle fans expected it to be. The Trojans got off to an early lead and kept the lead at eight for a while, midway through the first half. The Bruins then went on an 8-0 run and tied things up at the 6:14 mark. They were up by four points before USC went on a run of their own, and took the lead back 26-25 at the half. UCLA took the lead back to start the second period, pushing it to four again, 34-30. But the Trojans put up four points, and then the score remained knotted at 34 for seven minutes before USC was again able to score. The Bruins didn't put up a field goal for over nine minutes. 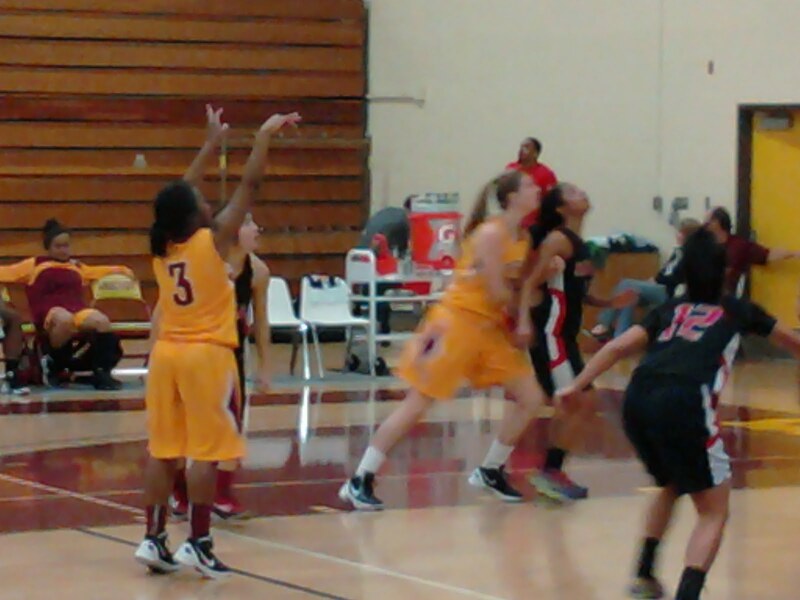 Crucial free throws by Trojan forward Cassie Harberts in the game's final minutes sealed the win for her team. Only two players scored in double figures: USC's Ashley Corral and UCLA's Rebekah Gardner. Box score. Corral's eight assists pushed her past Cheryl Miller on the all-time assists list. She is an underrated player, to be sure. The game was one of the best defensive battles I've seen in a while. Both teams kept each other out of the paint and forced outside shots, which no one was making in the second half, as USC shot 18.2 percent and UCLA, 24 percent. The game was also predictably physical, with much wrestling for the ball, hand-checking and numerous fouls. Some game photos are blow, but the entire game album is HERE. Both teams get props, as each are missing key players. USC guard Jacki Gemelos tore her left ACL in December, as did UCLA guard Antonye Nyingifa. Bruin guard Moriah Faulk also tore her ACL last Saturday in the Arizona State game. 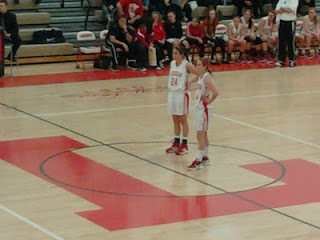 Thea Lemberger contemplates getting past Briana Gilbreath in the second half. Cassie Harberts' free throws in the final minute sealed the win for the Trojans. 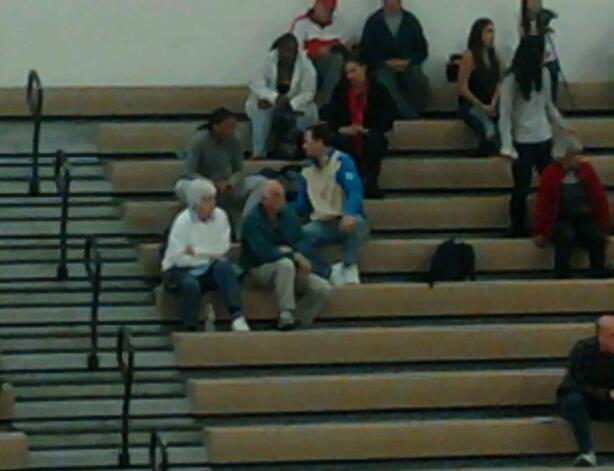 Jacki Gemelos, at top, watches Coach Michael Cooper break down the game strategy before tipoff. The USC Trojans are finding a way to cope without Jacki Gemelos - it's because they're playing for her. In researching for this piece, I also found a star player who is doing a noble job of moving through the grieving process. USC coaches also care about Gemelos and the rest of the team a great deal. It's common for teams who lose a key player to rally for a couple games before their performance declines. The fact that the Women of Troy made it through last week with two wins in Arizona, and a victory today at UCLA, says a lot about their drive and focus. They have lost only one game since losing Gemelos, who will have her fifth knee reconstruction surgery Tuesday. The photo gallery with this piece on www.hoopfeed.com is from a recent practice. Below are some extra shots. Jacki Gemelos throws up shots on the sidelines while her teammates practice. Freshman Thaddesia Southall, who is sitting out this season with an ACL tear of her own, rebounds for Gemelos. Gemelos works on her handles while her teammates scrimmage. A depleted UCLA Bruins squad hosts USC today at 2 p.m. PST. I'll be there like the Jackson Five. The Women of Troy are second place in the Pac-12 going into today's contest. Have you noticed Washington State isn't sucking this year? So has the Kitsap Sun, scout.com and Jayda Evans. The Cougars are tied for second in the Pac-12 going into today's match ups. The rising Oregon State Beavers are focusing on "winnable games." Here's a headline for you: Colorado hopes to keep their composure against Stanford today. ESPN analyst Debbie Antonelli projects that the Hurricaine's Shenise Johnson and Riquna Williams will both go first round in this year's WNBA draft. Fans seem to be worried that Rutgers' incoming freshman class will unravel like the class of 2008. Coach C. Vivian Stringer shakes off the comparison. Purdue's Brittany Rayburn put up a whopping 38 points last night in the Boilermakers' win over Minnesota, including an NCAA record 12 three-point shots. Cal trailed Colorado by 12 last night before surging back to win by 13. A very impressive display. UConn will play at Villanova tomorrow, and the very idea makes Huskies Coach Geno Auriemma ill.
Stanford will take on Colorado tomorrow, and you better believe the Cardinal will be prepared. NCAA president Mark Emmert's contract has been extended. Candace Parker talks about her favorite destinations, playing in Russia and traveling with kids. Angel McCoughtry provides a sneak peek of her upcoming music video. Ivory Latta will become a Parkinson's Disease ambassador. You knew that #5 Maryland loss was coming, and #11 Miami pulled off the upset, handing the Terps their first defeat. Clemson upset #21 North Carolina, ruining Tar Heels Coach Sylvia Hatchell's chance at a 600th win. #8 Kentucky overcame #7 Tennessee by one point. LSU came from behind to beat South Carolina by ten. Wonder why this write-up doesn't mention Gamecock Coach Dawn Staley being ejected from the contest. ESPN's "hoops across America" series checks in on Old Dominion. The Shock and Mercury exchanged point guards: Andrea Riley and Temeka Johnson. That trade makes absolutely no sense to me. Dishin & Swishin talks to Gary Kloppenburg and Carol Ross about their new coaching gigs with the Shock and Sparks, respectively. Oklahoma handed #14 Texas Tech their first loss. Texas upset #10 Texas A&M. After tonight's Baylor-Oklahoma State game, players from both teams prayed together. This is a beautiful picture. Coach Joe Ciampi is back - as assistant coach of the Atlanta Dream. Seattle high school star Katie Collier's comeback from leukemia is an inspiration to many. Mickie DeMoss knew she had to come back to Tennessee five years ago. St. Johns and St. Bonaventure also get shout outs. Cal freshman forward Reshanda Gray waits to check into last Saturday's game against Oregon. Gray leads the team in scoring and is third in rebounds. 3. It's a young woman's world out there: There are some notable exceptions -- Stanford's Nnemkadi Ogwumike, Delaware's Elena Delle Donne, Ohio State's Samantha Prahalis and Tennessee's Shekinna Stricklen among them. But senior stars are usually the rule in women's college basketball, not the exception. For whatever reason, and we don't have early entry to blame on this side of the college game, this season's senior class lacks oomph at the top of the sport. Senior stars such as Missouri State's Casey Garrison, VCU's Courtney Hurt, Eastern Michigan's Tavelyn James and Gonzaga's Katelan Redmon are wrapping up special careers out of the spotlight, but it looks like the players who have the most to say about what happens at the Final Four in Denver will be around for at least one more season. Of the teams in the first Top 25 of the calendar year 2012, only 10 were led in scoring by seniors. And the "revision of conventional wisdom" list.....no player of the year, and the title is up for grabs. True that. trouble for Duke, as sophomore guard Chloe Wells will miss the remainder of the season due to a violation of university policy. These last two weeks have seen an outburst of outstanding performances in high school ball. Guard Liz Wood of Virginia had a quadruple-double in her team's thrashing of a rival high school Friday night. She recorded 19 points, 14 rebounds, 12 steals and 10 assists. Another guard, New Jersey's Amanda Berntsen, set a school record at Chatham High School last Thursday. She has 1,492 points. Ohio guard Kailee Howe reached the 1,000-point mark on Dec. 30. Point guard Whitney Bunn of North Carolina eclipsed 1,000 points this past Friday. Congratulations to these young ballers. DePaul is going through it like never before. Keisha Hampton's season-ending injury means five key players are now out for the Blue Demons. Coach Doug Bruno hasn't seen anything like it before. Podcast: Beth Mowins and Debbie Antonelli interview Maryland Coach Brenda Frese and Taylor Hill of Ohio State. The Saturday scoreboard saw Oregon State almost upset Stanford; USC beat Arizona to sweet both desert state schools; UCLA defeated ASU, leaving the Sun Devils swept; and Utah garnered their first Pac-12 victory by putting away Washington. Stanford is struggling more than expected. Friday I published the player eligibility requirements for both the WNBA and NBA, as provided to me by the respective leagues. I had hoped to receive a response to a question I had about those stipulations before then, but I just obtained that answer this morning. I asked, "Can you tell me why WNBA draftees are required to be 22 and NBA draftees are required to be 19?" Of course there are exceptions that are laid out in the rules. But to be able to be drafted into the WNBA before age 22, an American player must have already graduated from college, or be about to graduate. (The only requirement for international players is that they are 20 years old). The WNBA issued this answer statement to my question: "All of the WNBA's eligibility requirements were negotiated with the Players Union, and have been working well for the league, the players and our friends at the NCAA for 15 years. Players come into the WNBA with a great maturity and readiness as athletes and as young women." What do you think about this? Why do you think males are allowed to be "less mature" to enter the NBA? Earlier today, St. John's upset #12 Louisville 72-64. I was watching the first hour of the game as I packed up my stuff at the hotel, and I had a feeling the Red Storm would do it. Elena Delle Donne put up a whopping 40 points in #20 Delaware's win over George Mason. She is ridiculous. #5 Maryland needed an overtime to fend off #23 North Carolina. The Terps seem like they're about to have an upset. Berkeley, Calif. - I checked out the Oregon at Cal game yesterday, making the trip to Haas Pavilion for the first time. I loved the intimacy of the arena and the caring of the fans. They know each player by name, and are very supportive. After the Bears won, the entire team divided up at tables and signed autographs for long lines of fans - many of them children. My full album is HERE. Oregon's Jasmine Holliday drives around Cal's Talia Caldwell in the second half. Cal's Reshanda Gray tries to block the inbounds pass. The coolest college fan giveaway ever: a team picture puzzle. Chandler's point guard, #3 Dezirae Ellis at 5-foot-1, can play against the bigs of St. Marys: #0 Chantel Osahor, at 6-foot-2, #13 Cortnee Walton at 6-foot-3, and #22 Courtney Ekmark at 6 feet. USC did not make a basket in the final 5:45 of the game, but did make eight of 11 free throws to beat ASU by 12. The Sun Devils only hit two baskets in the last 8:50 of the game, and missed seven of their last 10 charity shots. ASU had no players with double-digit scoring, and no player made more than three field goals in the game. Kimberly Brandon had three field goals and two of those came in the last 8:50 of the game. She scored her team's last buckets. ASU had big trouble with the USC press in the second half, as there was no Dymond Simon to help this year. Promise Amukamara ran into a blind screen set by Cassie Harberts of USC. Last season Simon ran into the same type of blind sceen, and missed several games with a concussion. You would think someone on the court or on ASU's bench would yell it out to their teammates. USC walk on Dominque Scott (Pasadena CC) made her first appearance for USC with 1:42 left in the first half. Former Trojan Kari LaPlante (class of 2011) was at the game to root for her former teammates. LaPlante currently plays for Alexandria, in Romania and was home for the holiday break. St. Marys is the number one high school team in the nation, according to ESPN Rise. 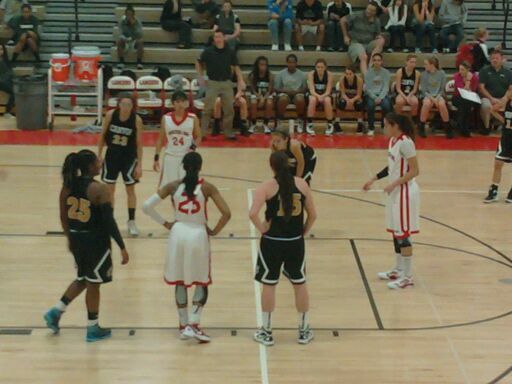 Tonight they faced off against Chandler High School, which is #5 in Arizona. Both teams have players going on to the next level. St. Marys has Shilpa Tummala, who verballed to Harvard in 2013. Also on St. Marys is a freshman guard Courtney Erkmark. 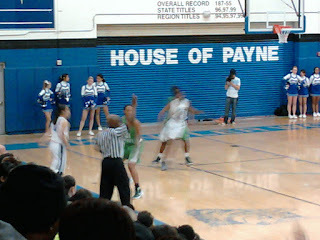 She scored 27 points in the contest and has nearly all the skills that you would expect a high school senior to have. I believe she is the daughter of St. Marys coach Curtis Erkmark. Cortnee Walton (2013) is going to Louisville, and she also played a strong game. Chandler has senior Simone Westbrook going to Arizona. Je Zhe Newton is highly-ranked, but didnt dress for some reason. Chandler also has an outstanding point guard in Dezirae Ellis; she hustles all over the place. She can go to the hoop, shoot the three and she can pass as well as anyone I have seen recently in the high school game. She had around 25 points tonight, and was the spark plug for the Chandler team all night. If she hasnt been signed by someone, she is a senior, she is a steal, She is only 5'1" but plays big for her size. St. Marys pulled out the game 68-62, but not without a struggle. It was a tight game for the first half with St. Mary's leading 33-30 at the break. They were able to open up a 55-44 in the first few minutes of the fourth quarter, and then Chandler went on a 11-1 run to trail by one point 56-55 with 4.21 left in the game. St Marys went on a streak to make it 63-55, and the rest of the game was foul shots made by St. Marys to hold on for the win. There is no shot clock in Arizona high school games. UCLA coach Cori Close was at the game scouting some of the players, and spoke to both coaches after the game. 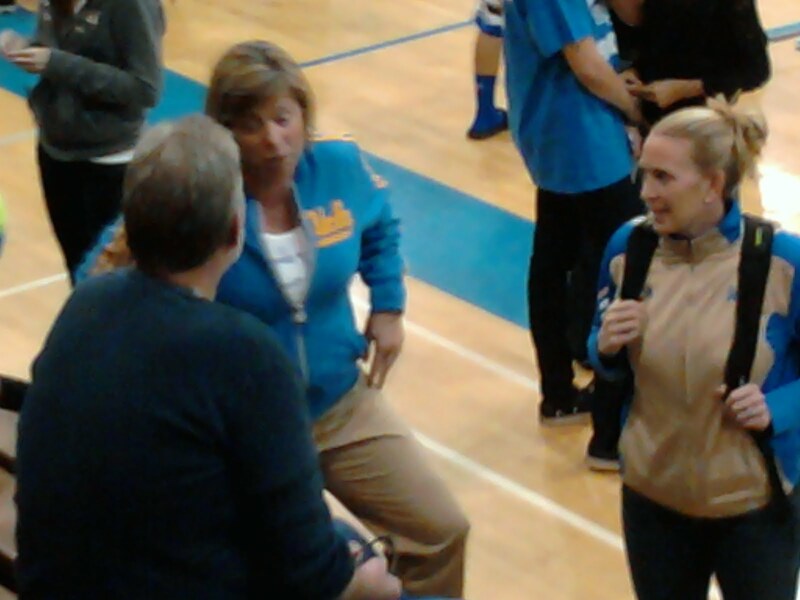 UCLA Coach Cori Close talks with a parent after the game. Chandler's gym is called the "House of Payne," and IM in OC didn't find out why that is. 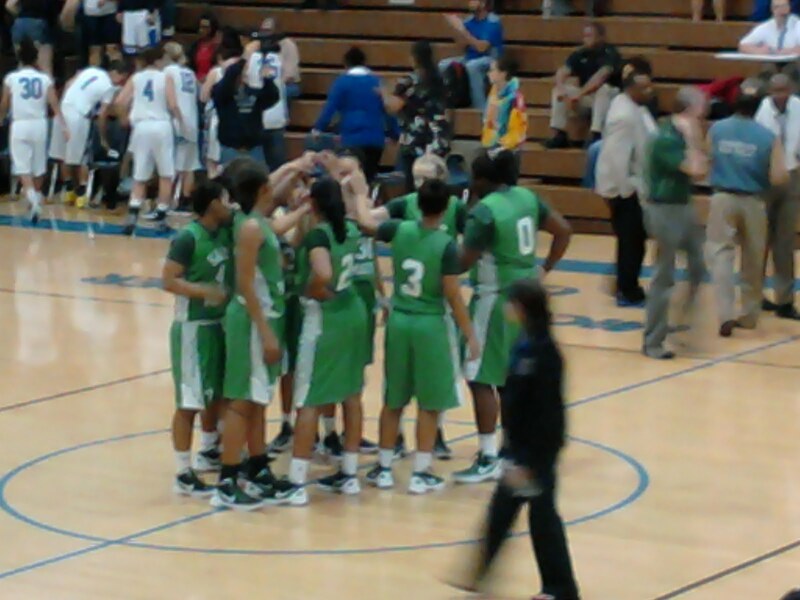 St. Mary's players gather at center court after team handshakes....a hard-fought win. Fans have been speculating as to whether or not Baylor star Brittney Griner would forego her senior year to enter the 2012 WNBA draft in a few months. The question is, could she be eligible? I took the query to the offices of the WNBA and NBA, and below are the stipulations as they were sent to me. It looks like Griner couldn't enter this year's draft, because she won't be 22 until October (unless she was a candidate for early graduation). If Griner were a male, however, it appears she'd only have to be 19 to be drafted. than two (2) NBA Drafts. in the United States. section 6. application to “Early Entry” Players. been drafted in a Subsequent Draft will apply.